Read part one of this article from the following link. Android is one of the most popular operating systems for mobiles. 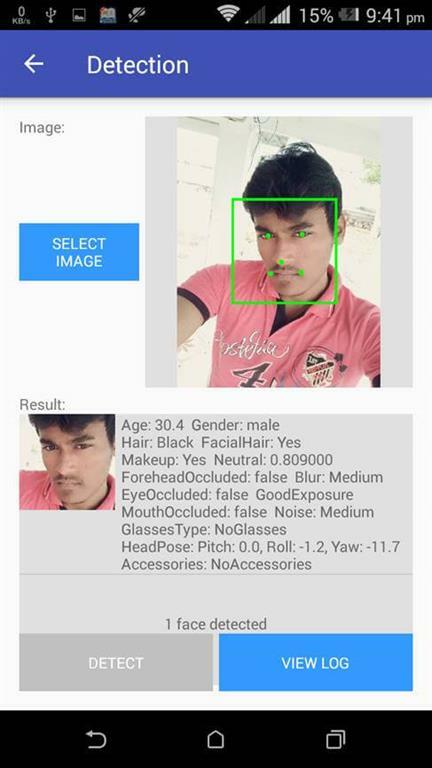 In this article, I will show you how to detect a face with the help of Microsoft Face API. Go to activity_main.xml file and click the text botton. 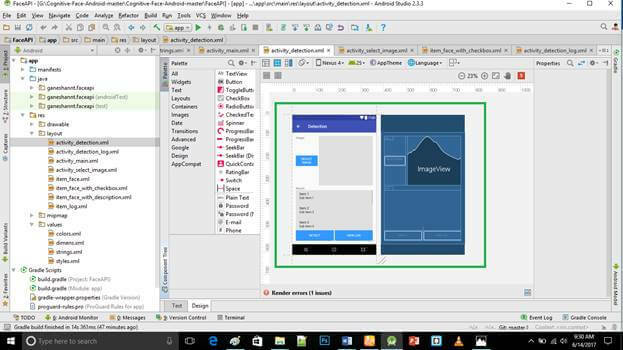 This XML file contains the designing code for Android app. In activity_main.xml, copy and paste the below code. Create a new activity_detection.xml file (File ⇒ New ⇒Activity⇒Empty_activity). Go to activity_detection.xml, and click the text botton. 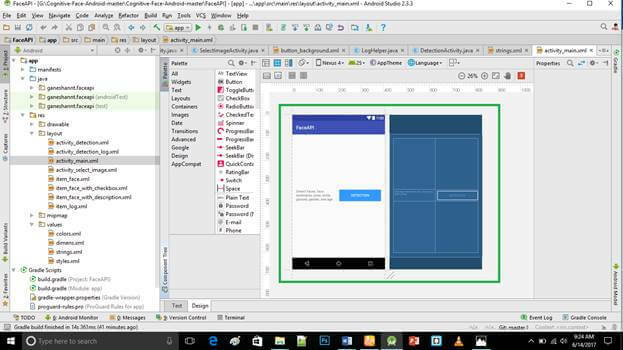 This XML file contains the designing code for Android app. In activity_detection.xml, copy and paste the below code. Create new activity_select_image.xml file (File ⇒ New ⇒Activity⇒Empty_activity). Go to activity_select_image.xml and click the text bottom. In activity_select_image.xml, copy and paste the below code. Create new item_face_with_description.xml file (File ⇒ New ⇒Activity⇒Empty_activity). Go to item_face_with_description.xml, then click the text bottom. In item_face_with_description.xml, copy and paste the below code. In MainActivity.java file, copy and paste the below code. Do not replace your package name otherwise the app will not run. 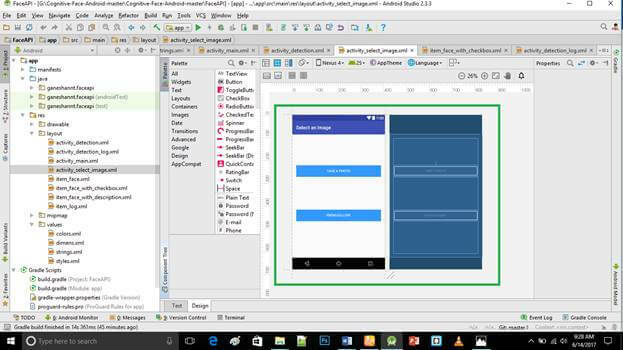 Create three (name : helper , log , ui) Android package folders (java->>new->>folder->>package folder). In helper folder, create file (class name: embeddedgridview,Imagehelper,storagehelper ) (File ⇒ New ⇒Java class). In EmbeddedGridView.java, copy and paste the below code. Do not replace your package name otherwise app will not run. 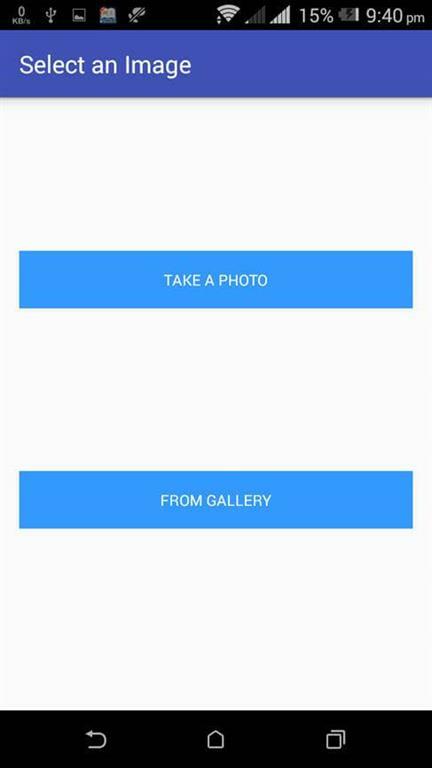 It is used to pick the image from photos album. * Defined several functions to load, draw, save, resize, and rotate images. // The maximum side length of the image to detect, to keep the size of image less than 4MB. // Resize the image if its side length is larger than the maximum. // Ratio to scale a detected face rectangle, the face rectangle scaled up looks more natural. // Load the image into InputStream. // For saving memory, only decode the image meta and get the side length. // Calculate shrink rate when loading the image into memory. // Draw detected face rectangles in the original image. And return the image drawn. // If drawLandmarks is set to be true, draw the five main landmarks of each face. // Highlight the selected face thumbnail in face list. // Crop the face thumbnail out from the original image. // For better view for human, face rectangles are resized to the rate faceRectEnlargeRatio. // Return the number of times for the image to shrink when loading it into memory. // The SampleSize can only be a final value based on powers of 2. // Get the rotation angle of the image taken. // Make the left edge to left more. // Make the top edge to top more. 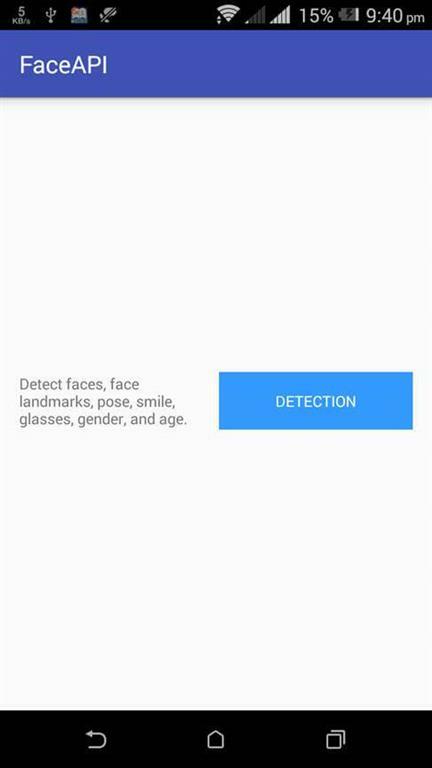 It is used to allocate the storage space for face detecting images. * Defined several functions to manage local storage. In log folder, create file(class name:DetectionLogActivity ) (File ⇒ New ⇒Java class). In DetectionLogActivity.java, copy and paste the below code. Do not replace your package name otherwise the app will not run. // The adapter of the ListView which contains the detection log. In ui folder, create file (class name:DetectionActivity,Select-Image_Activity,MainActivity ) (File ⇒ New ⇒Java class). In DetectionActivity.java, copy and paste the below code. Do not replace your package name otherwise the app will not run. // Background task of face detection. // Get an instance of face service client to detect faces in image. // Show the result on screen when detection is done. // Flag to indicate which task is to be performed. // The URI of the image selected to detect. // The image selected to detect. // Progress dialog popped up when communicating with server. // When the activity is created, set all the member variables to initial state. // Disable button "detect" as the image to detect is not selected. // Save the activity state when it's going to stop. // Recover the saved state when the activity is recreated. // Called when image selection is done. 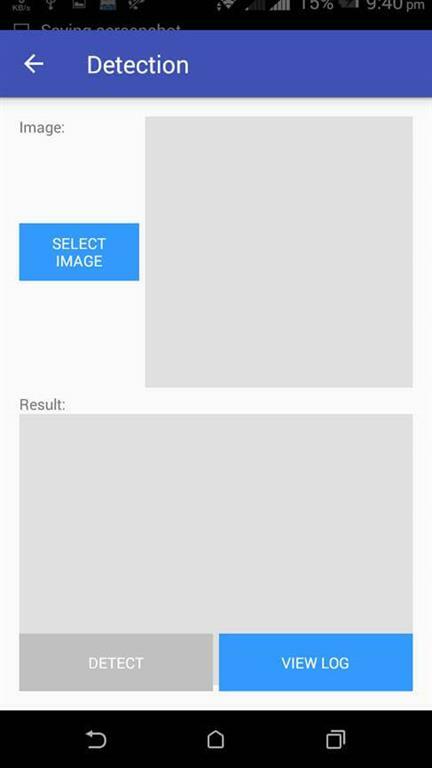 // If image is selected successfully, set the image URI and bitmap. // Show the image on screen. // Clear the detection result. // Clear the information panel. // Enable button "detect" as the image is selected and not detected. // Called when the "Select Image" button is clicked. // Called when the "Detect" button is clicked. // Put the image into an input stream for detection. // Start a background task to detect faces in the image. // Prevent button click during detecting. // View the log of service calls. // Detection is done, hide the progress dialog. // Enable all the buttons. // Disable button "detect" as the image has already been detected. // The information about the detection result. detectionResult = result.length + " face"
// Show the detected faces on original image. // Set the adapter of the ListView which contains the details of the detected faces. // Show the detailed list of detected faces. // Set whether the buttons are enabled. // Set the information panel on screen. // Add a log item. // The adapter of the GridView which contains the details of the detected faces. // The thumbnails of detected faces. // Initialize with detection result. // Crop face thumbnail with five main landmarks drawn from original image. // Show the exception when generating face thumbnail fails. // Show the face thumbnail. // Show the face details. // The activity for the user to select a image and to detect faces in the image. // Deal with the result of selection of the photos and faces. // When the button of "Take a Photo with Camera" is pressed. // Save the photo taken to a temporary file. // When the button of "Select a Photo in Album" is pressed. Click the "Make Project" option and run. 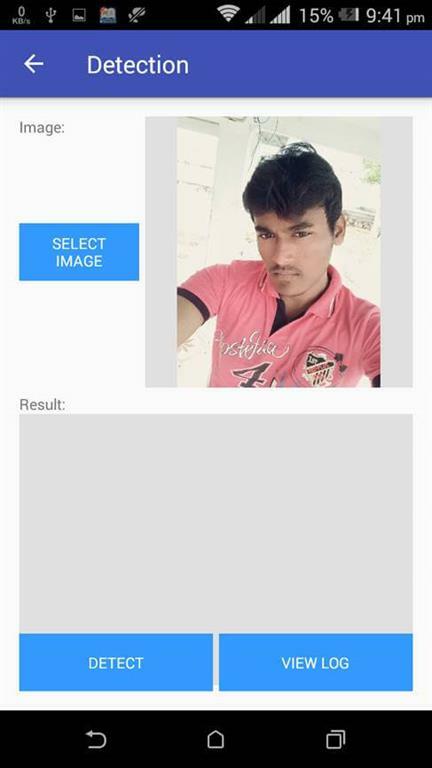 Here, we have successfully detected the face using Face API in Android app.